Tungsten Inert Gas welding or TIG welding is a popular type of welding that utilizes tungsten electrodes to join various metals. Tungsten electrodes are essential to the process, as it channels the current required to establish the arc. 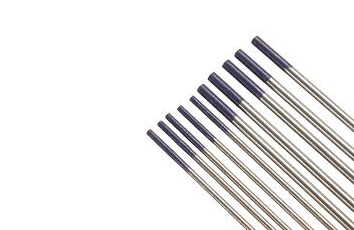 The Tungsten Electrodes for Welding can be alloyed with a variety of metals. Different types and sizes of tungsten electrodes are used for various types of welding applications and materials. Ceriated Tungsten TIG Welding Electrode 1/16"x7"
Ceriated Tungsten TIG Welding Electrode 1/8"x7"
Ceriated Tungsten TIG Welding Electrode 3/32"x7"
Ceriated Tungsten TIG Welding Electrode 5/64"x7"
Composite Tungsten TIG Welding Electrode 1/16"x7"
Composite Tungsten TIG Welding Electrode 1/8"x7"
Composite Tungsten TIG Welding Electrode 3/32"x7"
Composite Tungsten TIG Welding Electrode 5/64"x7"
Lanthanated Tungsten TIG Welding Electrode 1/16"x7"
Lanthanated Tungsten TIG Welding Electrode 1/8"x7"
Pure Tungsten TIG Welding Electrode 5/64"x7"
Pure Tungsten TIG Welding Electrode 1/16"x7"
Thoriated Tungsten TIG Welding Electrode 5/64"x7"
Thoriated Tungsten TIG Welding Electrode 1/16"x7"
Lanthanated Tungsten TIG Welding Electrode 5/64"x7"
Zirconiated Tungsten TIG Welding Electrode 5/64"x7"
Zirconiated Tungsten TIG Welding Electrode 1/16"x7"
Yttrium Tungsten TIG Welding Electrode 5/64"x7"
Yttrium Tungsten TIG Welding Electrode 1/16"x7"